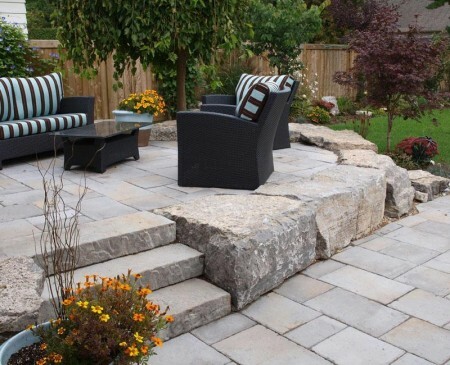 Natural Steps - Legends Landscape Supply Inc. The steps leading to the entrance of your home (front, side or back) need to form a bridge. The steps must tie the exterior design to the interior design, or at least to the entrance approach. The entrance to your home should be welcoming, and properly chosen natural steps can help create a comfortable, inviting ambiance. In building natural steps, there are two main design options. Strip stones or risers. Pictured here you can see both styles used effectively. The lower levels use strip stones, while the higher steps, closer to the entrance, use risers. Strip stones can be used between exposed stairs to create the illusion of full sized flagstones stacked atop each other. They can save money by maximizing the visible footprint of a piece of stone. Installation can be challenging so we suggest discussing your intent with one of our highly experienced team members. Risers are quite thin, at around half an inch, minimizing waste. They allow a rock face to be exposed vertically, rather than an edge exposed horizontally. The look achieved can be more refined and clean than with strip options. Natural materials are not completely immune to the elements, but proper care can help prolong the life of your investment. Stop by our showroom and say hello today. We’re always happy to meet new people and eager to talk about what could be done with your property.